Currently playing in the Dutch First Division alongside Den Haag and Helmond Sport (our pre-season opponents in 1999), Heracles were previous League winners way back in 1927 and 1941. 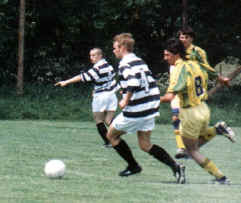 They play in the modern all-seater Polman stadium, and number Scott Calderwood among their ranks, formerly of Birmingham City. The marvellously named Tom Kaak was also a Heracles player before joining Darlington at the start of the season. 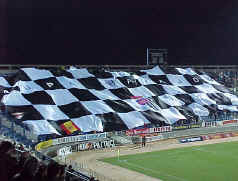 Crossing the border across to Belgium and we come upon the black and whites of Aalst, pictured here in a recent game against Bruges. The Velvet Revolution that swept Havel into power changed the very fabric of the Czech Republic, and thus allowed the creation of a Prague-based football team dedicated to the twin ideals of sporting excellence and drink. Any team that is founded by a toon fan, a sussex seagull and some geezer from Millwall is bound to have some "history", and so it is with our intrepid band. Many details have been lost in the mists of drink, but a cat called gromit, contracts signed on a "pints per goals" basis, and murderous deeds perpetrated against dreaded rivals IFC litter the pages of Dynamo's history. Having endured an even worse season than us (finishing bottom of the Austrian Bundesliga), manager Hans Kondert is under pressure from the dwindling crowds at the Linzer Stadion to improve matters next time out.